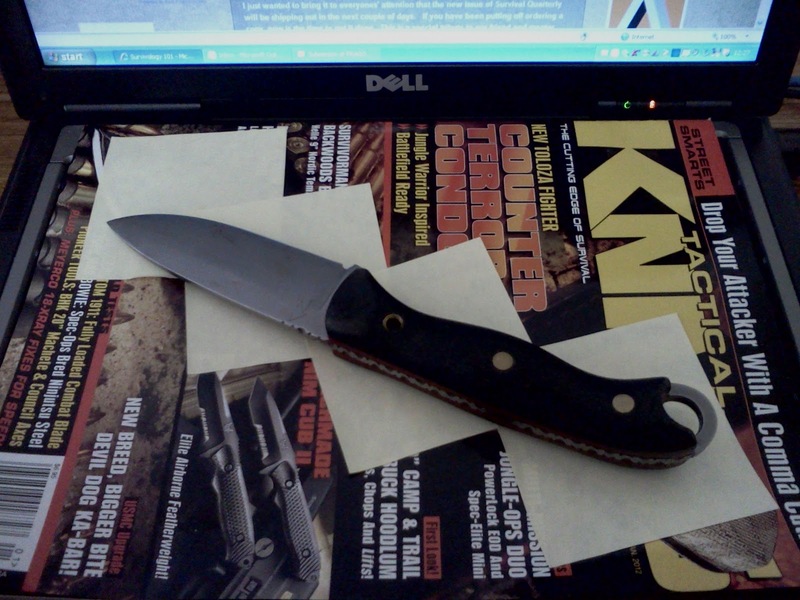 Survivology 101: My knife on the cover of Tactical Knives Mag! My knife on the cover of Tactical Knives Mag! WELL THAT WAS NOT EXACTLY A LIE! It was laying on the cover to be exact. I guess rather or not I'm a liar depends on how you define the word ON. Perspective in theory of cognition is the choice of a context or a reference (or the result of this choice) from which to sense, categorize, measure or codify experience, cohesively forming a coherent belief, typically for comparing with another. One may further recognize a number of subtly distinctive meanings, close to those of paradigm, point of view, reality tunnel, umwelt, or weltanschauung. To choose a perspective is to choose a value system and, unavoidably, an associated belief system. When we look at a business perspective, we are looking at a monetary base values system and beliefs. When we look at a human perspective, it is a more social value system and its associated beliefs. The reason that I'm blogging this today is that I am seeing allot of "perspective tweaking" going on in all lines of communication recently. Maybe it is the upcoming election season or the general state of unrest around the world. Rather it be one candidate against another, or religious ideals, or personal choices. There seems to always be a right and a left, a black and a white. Both sides are exploiting the gray and then refusing to acknowledge that a gray even exists. As you move around day to day and gather bits and pieces of misinformation about the state of the world; remember to look back and analyze that information. If it seems too one sided, seek confirmation on that particular issue. People still have the right to make up their own damn mind about issues based on their own personal beliefs and experiences. When you get one group distorting all the facts and ignoring legitimate, relative, supporting information then you have attempts at mind control. I request that before you debate an issue, whatever it is. Do some research, form YOUR OWN opinion, confirm what you believe are the facts and then respect the decisions of those that have come to a different conclusion. If you can not do this, what place would you have in the repair of our broken down machine? Eventually the MACHINE is going to have to go in for servicing and repair. Those propaganda peddlers will have no place in the new and improved version. That is unless you continue to accept the BS, and let others make decisions that affect not only you but your entire way of life. Make a difference, start now or the only perspective you will have is on your knees. I am not here to say anyone is wrong for believing what they believe. However, you are wrong if you believe what you are manipulated into believing. The next time someone is trying to convince you that chocolate is better than vanilla or Chevy is better than Ford, simply ask them to PROVE IT, OR KEEP YOUR OPINION TO YOURSELF. Keep that in mind as the three ring election circus is about to begin.